Spencer: Part of the problem with “doing the right thing” is that it’s usually the harder option, and quite often has no obvious reward outside of simply knowing that you’re in the right. 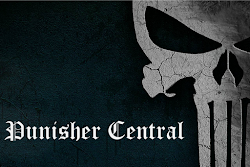 For example, we see corrupt bankers and politicians steal from millions and never face any consequences, while those who try to bring their crimes to light are fired, arrested, or simply ignored. It’s easy to see why some people decide that morality doesn’t matter, but for many of us that simply isn’t an option: doing the right thing is too important to give up. Archie 15 finds the Riverdale Gang taking the high road in a few different ways, but that doesn’t necessarily guarantee them victory, or even happiness. Co-writers Mark Waid and Lori Matsumoto and artist Joe Eisma split this issue into two stories, so that’s how I’m going to approach it. Their first tale finds Jughead snapping Archie out of his funk just in time to throw together his parents’ anniversary party. Part of why this scene is so interesting to me is because it highlights the way “doing the right thing” can take on different forms for different people. Jughead probably wouldn’t be bothered if he missed his parents’ anniversary because that’s the kind of kid he is, but Archie would because that’s the kind of kid he is. 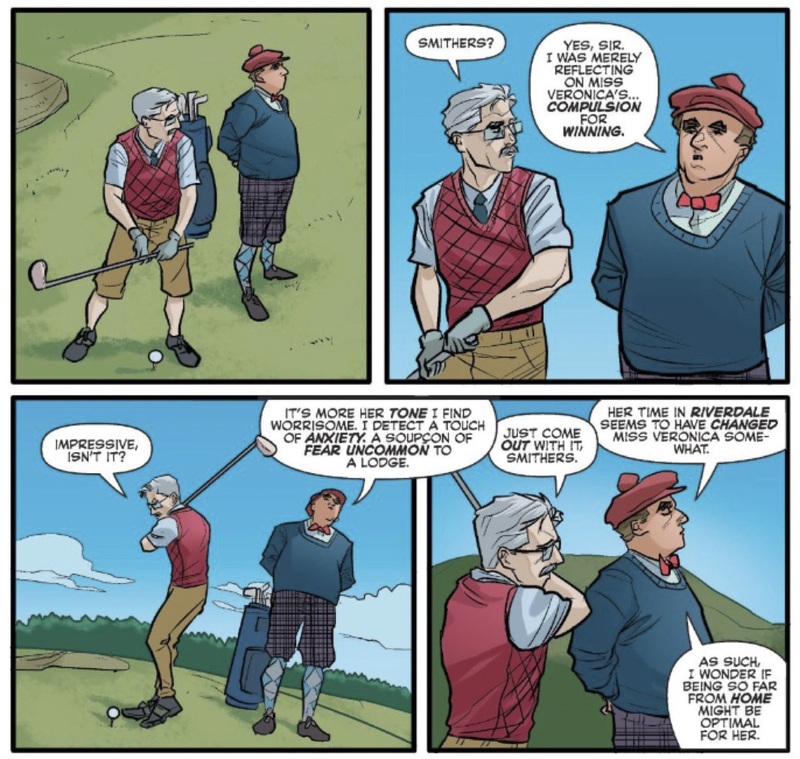 Archie wants to hide in Jughead’s simple, carefree persona, but he can’t because it would mean disappointing his parents, and more significantly, because it would mean he wasn’t being himself. Pretending to be Jughead would be selfish, and that’s not something Archie can keep up for long. Archie’s inherent goodness naturally brings pain with it — you can’t care for people and not feel sadness at some point — but that doesn’t mean he should stop following it, stop caring. Riverdale’s inherent goodness is also on display as they rush to help Archie put his party together. Jughead nearly loses his mind making arrangements, Kevin lends his expertise, Betty and co. protect Archie from his own clumsiness — most of these kids probably don’t care about this specific party, but they care about their pal Archie, so of course they have to help him out. Helping people, caring, being selfless, just plain ol’ doing the right thing is such a part of Riverdale’s DNA (and I’ll circle back to that in the second story as well). The party goes off without a hitch, but that doesn’t mean Archie’s all better. In the end, putting together his parents’ party was the right thing to do, but that can’t protect Archie from pain and unhappiness. It can’t cure a broken heart. Meanwhile, across the ocean, Archie 15‘s second story finds Veronica scoring a decisive victory over her mean-girl boarding school rival Cheryl Blossom. Buying the Blossom family’s company away from them is such a ruthless tactic (so, a typical Lodge move), but interestingly enough, Hiram Lodge seems to think of it as his own version of “doing the right thing” — he didn’t buy the company to be a cutthroat businessman, he did it to make his daughter happy, and may have potentially saved a company nearing bankruptcy in the process. That’s not enough to assuage Veronica’s newly-found conscience, though. Veronica’s passed up quite a few opportunities to take the high road in her feud with Cheryl, but she finally does so by attempting to genuinely apologize for what she did to the Blossoms. Her reward? The horrific discovery that the Blossoms are moving to Riverdale, and that Cheryl will be going to school with Archie! This situation is a direct consequence of Veronica’s actions, and not something that could be averted even by an apology from Veronica. That doesn’t mean it wasn’t the right thing for her to apologize anyway, but I’ll be interested to see if Veronica feels the same way. At least Veronica will be soon returning to Riverdale as well. This may actually be one of the most drastic “doing the right thing” moments in the entire issue. The only reason I can see why Hiram would decide to return to Riverdale is to make Veronica happy; he doesn’t personally get anything out of it, and he doesn’t seem all too fond of the conscience Veronica developed there either. Returning to Riverdale even means backpedaling on the harsh stance he took on the town when he sent Veronica away, which seems unusual for this prideful man. Yet, he’s letting Veronica come home anyway because it’s what will make her happiest. Maybe that’s rather basic parenting (I’m certainly not suggesting we give him a medal or anything), but it’s still a major leap forward for Hiram Lodge. Could it be that Riverdale’s infectious, noble spirit has gotten to Hiram too, the way it has Veronica? Could he actually be growing some sort of conscience? If any place could have that effect on someone, it’s Riverdale. What do you think, Ryan? And hey, Veronica’s mother is namedropped in this issue — what’s the deal with her? Have we ever seen Mrs. Lodge before, in any version of Archie continuity? Ryan M.: Mrs. Hermione Lodge is a peripheral character whose appearances have been seldom, but she’s usually portrayed as the kind of woman bred in the Lycée: cold, concerned with social power, and less interested in raising her daughter than her next DAR meeting. Waid threw in this mention in a casual way, but it caught my attention, too. Maybe we are seeing some foreshadowing of an appearance from the woman in whose absence Veronica became Veronica. The other two people most responsible for Ronnie are Hiram and Smithers. Waid shows us their dynamic in a pair of scenes that demonstrate how much they love their little Veronica. While Hiram offers tactical support and advice for Veronica, it’s Smithers that notices her emotional change. 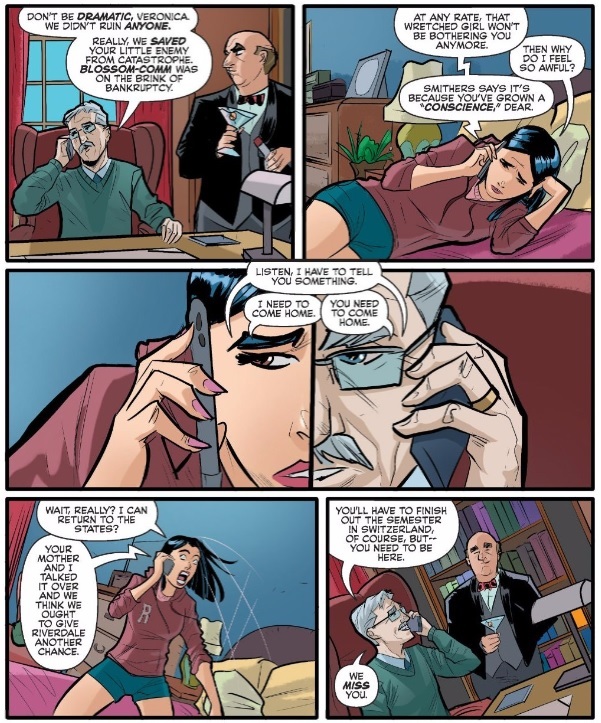 Hiram and Smithers are a team, and the nonverbal communication on the first panel is highlighted by the change in the angle of the perspective. In that panel there is no sky to see and we see Hiram notice that Smithers has something to contribute. Smithers never rises above his station. He is respectful and does what is required of his post. Here, he is a caddy and a counselor. He is both direct about his thoughts and tactful enough that Hiram will believe that moving Veronica back to Riverdale was his own idea. Look at how Eisma shows Smithers’ attempts to communicate with Hiram. First, making eye contact in perhaps his most direct attempt, mentioning a worrisome compulsion for winning. The language feels deliberate. Smithers is talking about a problem. “Compulsion” is not used to describe the good instincts and habits in our lives. Of course, this tactic does not work too well. Lodge dismisses the potential problem and returns to his swing, leaving Smithers to try another angle. The back and forth here is so well-oiled that it implies that this scenario has played out countless times in Veronica’s life. The men who loved her most, working together to keep her happy. It’s a dynamic that informs Veronica’s background and the way that she shows love to others. Though despite not having any models for expressive emotion, she responds to new of her move to Riverdale with a squee of hearts and flowers. The conspiratorial look in Hiram’s face as he high-fives Smithers again places the two of them as a team. Where Mrs. Lodge may fit in is not clear. Waid chose to place this Hiram-Smithers thread in a story paired with a Fred and Mary Andrews story. Certainly the Andrews family dynamic is much closer to a nuclear family, but there is more than money that separates the way that they deal with their children. Of course, the Andrews are pleased that a party is being thrown in their honor, complete with fountain, but the first thing they remark upon is the people that came to see them before even noticing the gifts. They don’t talk to their son in terms of war metaphors, they are emotionally honest about what he means to them. 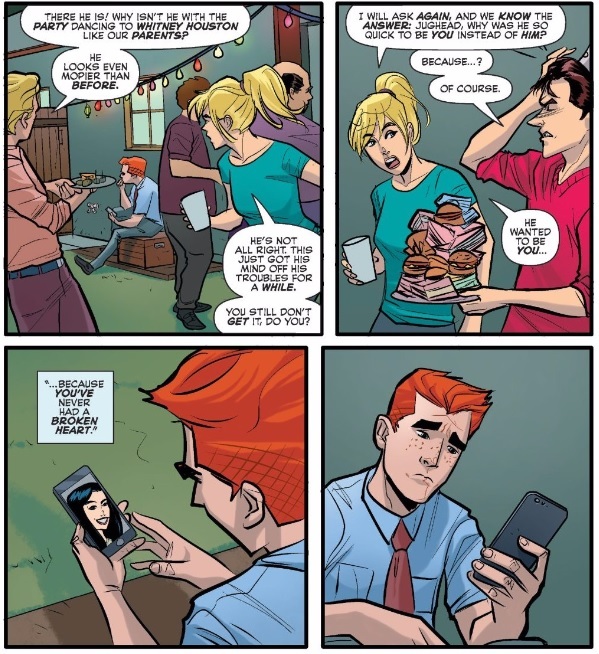 The last moment between Archie and his parents is sweet and provides a moment for Archie to do good, even if he feels awful. Fred’s expression as he stands in his backyard surrounded by the people he loves as his son offers him one more wish, is a sweetly powerful moment that demonstrates that sometimes if you do the right thing for long enough, you can build a happy life.